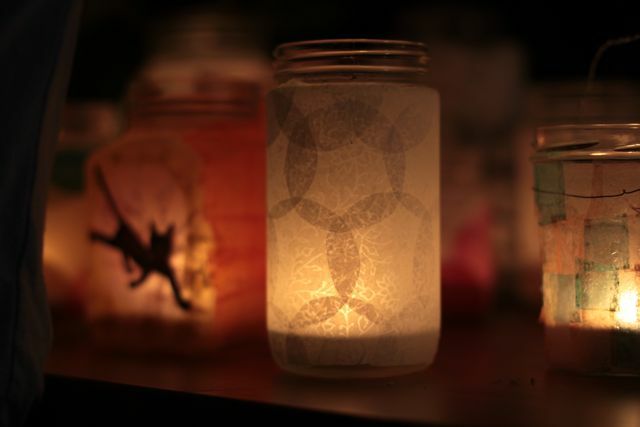 It is that time of year again when we start to make glass jar lanterns. This is a wonderful Autumn craft activity that you can do before Halloween and use for both Halloween and for Martinmas Lantern Walk. We were introduced to the Lantern Walk by our Waldorf Playgroup when we lived in Brooklyn and have enjoyed making lanterns ever since. We no longer attend the Brooklyn Waldorf Lantern Walk but I love to look back at these photos of the annual Lantern Walk gathering in Prospect Park. One thing I have discovered after years of moving from place to place, is that you can take the good others have taught you, the spirit of an event, and the memory of a time and place with you and share the goodness with others. I loved this occasion, it lighted up our lives, and so I decided to share the light with new friends by organising our own Lantern Walk. 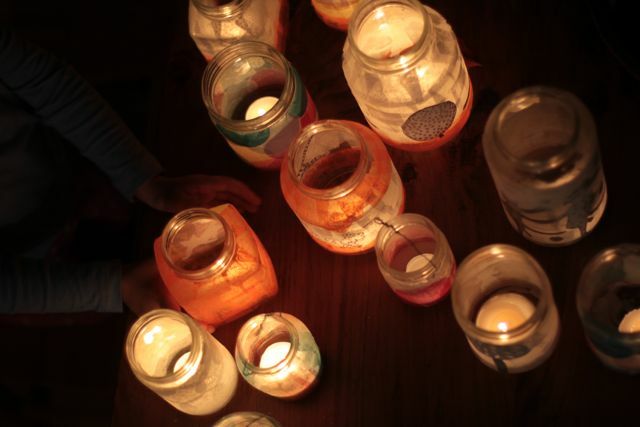 The Lantern Walk coincides with Martinmas, a very old European celebration dating back to the Middle Ages, which celebrates the life of St. Martin of France. He was known for his gentleness, his unassuming nature and his ability to bring warmth and light to those who were previously in darkness. Lantern walks are accompanied by singing and have become the traditional way of celebrating Martinmas in many European countries. 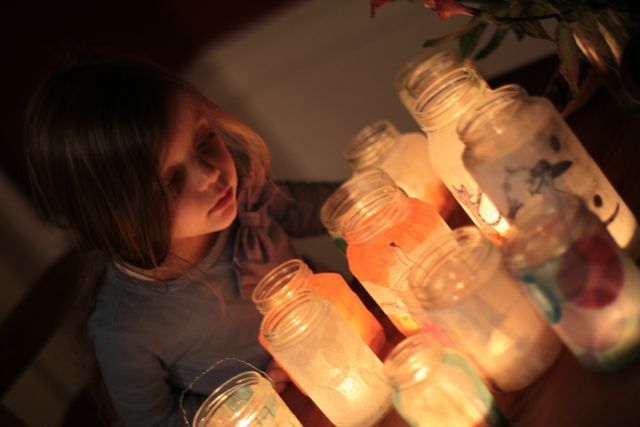 The children make lanterns to carry light into the approaching darkness of winter. The lantern is a symbol of the children’s own individual light; they give protection to our own little ‘flame’ so that we may carry it safely through the dark winter months ahead. I am currently working on a flier – and plan on inviting neighbors and friends. I hope to hold a lantern making workshop next Tuesday – which just happens to be a no school day because of the election (Give me an O-B-A-M-A!). Our Lantern Walk will be the following Sunday, November 11th. Today I have been busying making lanterns for our door step, and this year I have decorated some with cats, so that I can use them at Elle’s Black Cat Party planned for November 3rd. 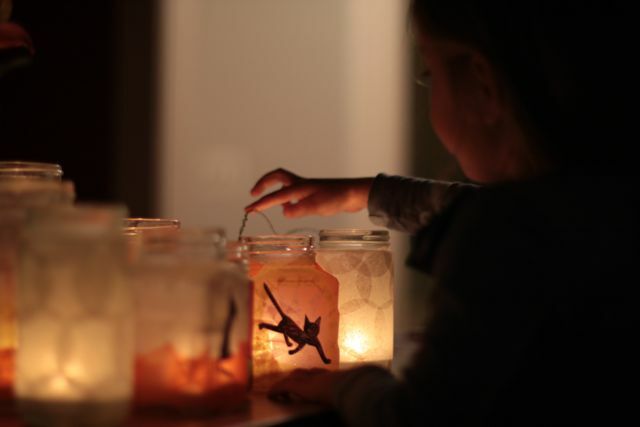 Feeling pleased that the glass jar lanterns will be used for Halloween, followed by Elle’s 4th Birthday, and then the Lantern Walk. For those wishing to make glass jar lanterns, I have previously posted a more detailed glass jar lantern tutorial . This entry was posted in C R E A T E and tagged autumn, lantern, waldorf.